What is a New Jersey Non-Disclosure Agreement? New Jersey Non-Disclosure Agreement: What Is It? 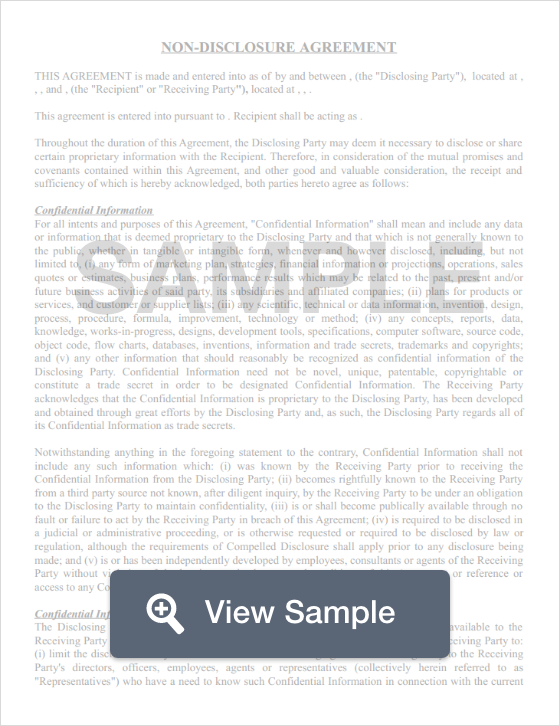 A New Jersey non-disclosure agreement is commonly known as a confidentiality agreement. The goal of a New Jersey non-disclosure agreement is to protect trade secrets and other confidential business information. When an employee or a contractor signs a New Jersey non-disclosure agreement, they are entering into a legally binding contract. Non-disclosure agreements and trade secrets are regulated by N.J. Rev. Stat. §§ 56-15-1 through 56-15-9. This is known as the New Jersey Trade Secrets Act. Because the purpose of a New Jersey non-disclosure agreement is to legally protect trade secrets, it’s important to know how the New Jersey Trade Secrets Act defines the term “trade secrets.” N.J. Rev. Stat. § 56:15-2 defines a trade secret as information held by one or more person in a business that may be a formula, pattern, compilation of business data, program, device, method, technique, design, diagram, drawing, invention, plan, procedure, prototype, or process with its own actual or potential financial value. This value occurs because the information isn’t general knowledge that the public has or that is something that can easily be determined by another business for their own economic advantage. The business claiming information as a trade secret must take reasonable steps to keep that information private. New Jersey’s Trade Secrets Act also explains when businesses entitled to damages as well as the three year limitation on the ability to take legal action. New Jersey businesses should also consider using a New Jersey noncompete agreement to protect their interests.